Sad Childhood, Touching Story. New York, 7/26/2008. This story of a young child being accused of faking an illness and being put through so much horrible treatment by all the adults around him including his own parents is shocking. I have never heard such a horrible story. It is like a story out of the movies. And to think it is actually true. I was particularly touched with the part where the little boy was trying to walk home from school and had to use the fence along the street to keep from falling down and how humiliated he felt when people would stare at him. It made me cry to think that a little boy could be forced to live through that kind of humiliation. Review from Barnes & Noble. 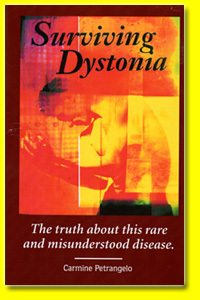 "The cruel pincers of pain and emotional trauma caused by people’s attitudes toward disability, forged an idea for a book about (Carmine Petrangelo's) medical journey. 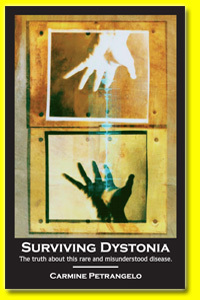 The book Surviving Dystonia, is a skillfully crafted work which takes readers into his personal odyssey as he seeks to understand, and then to control Dystonia."